As my youngest child was getting ready for school, I had an e-conversation with my sister-in-law. As I often do when I am reading someone’s story, I tried to imagine what it’s like to have one child graduating high school this year and another one doing the same a year later. I could picture it, but it was surreal to me. It’s not my current transition. But it is hers. My whole year has been an extended transition: One child entered high school while one started middle school. Every day, I switch gears between fellow high school-er parents talking about student drivers and SAT prep and the typical middle school concerns of “mean girls” and safe texting guidelines. Meanwhile, I’m still in the “playdate” phase of raising my third child. As I write this in the early morning, coffee half-consumed, my iCalendar keeps popping up with new band performances and rehearsals. It’s comforting to “hear” from my oldest son, if even through a brief data entry about yet another place I have to drive him. Maybe this title should be about interruptions and not transitions, but wait! Aren’t they often the same thing? Just like my sister-in-law has a child leaving the nest and the years of younger children needing her full-time attention are over, I am almost ready to go back to full-time work but have a child with special needs that are best met right now by me. I am making a transition from full-time mother to career, but I’m not at the end goal yet. Ultimately, new chapters in our lives come with interruptions. It isn’t usually a smooth glide from one chapter to the next. Just like a well-written novel, the last few pages of a chapter must guide the reader to the drop-off where the story picks back up again with a turn of the page. If one chapter ended with a cliffhanger: “and he jumped,” to the start of the next: “but landed on a pile of bushes,” wouldn’t we want the author to fill in some of the blanks for us, at least after the fact? We would feel cheated if we didn’t experience some of the in-between and before moments. What made him jump? Why was there a bush there? Did anyone see it happen? New chapters in our lives come with #interruptions, but we would feel cheated if we didn’t experience the in-between moments of #transition. These shifts in life stages are interruptions in our plans. They are the in-between moments. For me, it’s not time to work 40 hours outside the home again. That dream is interrupted by another one: Motherhood. I didn’t know that as we launched the last child into school, we’d uncover areas of concerns that would send me to five specialists. My plans were to start earning funds for the one heading to college in a few years. Five specialists and two regular therapies were not in my plans. They were not wanted interruptions. But they did get us ready for whatever comes next. I can multitask like a fiend now! I know when to slow things down. The right job will be there when I need it—and my son will be in a better place to manage his own care as he grows. I’m not sure we’re meant to abruptly depart something old to engage in something new without some processing. That’s why transitions are to be embraced, why interruptions ultimately serve us. Not only do they make us more flexible, but they pave a way for what is next. They give us some time to get a grip. After the death of Moses, the Lord spoke to Moses’s assistant Joshua. How about years later when the Israelites were in exile in Babylon? Exile is a pretty significant interruption. An unwanted move. A transition to a different culture even. These are the words of the letter that Jeremiah the prophet sent from Jerusalem to the surviving elders of the exiles, and to the priests, the prophets, and all the people, whom Nebuchadnezzar had taken into exile from Jerusalem to Babylon. This was after King Jeconiah and the queen mother, the eunuchs, the officials of Judah and Jerusalem, the craftsmen, and the metal workers had departed from Jerusalem. Let’s be honest: Transitions always need a few moments of mourning what was so we can move on to what is. If we skip the mourning part, we get stuck. Are you crossing a bridge of transition (job, relationship, season of life, geographical move, etc.)? Have you taken the time to mourn properly? Does it help you to know there’s a plan and purpose to your interruption and that you are being prepared for something just ahead, something perhaps still covered by fog, not completely visible? *This blog is a featured column at Your Tewksbury Today. **It has also been shared at Mom 2 Mom Monday Link-Up, Make a Difference Mondays, Simply Inspired Wednesdays, Grace & Truth, A Little R & R, RaRa Link-Up, Dance With Jesus, Blessing Counters, Coffee & Conversation, Saturday Soiree, and Christian Mommy Blogger. 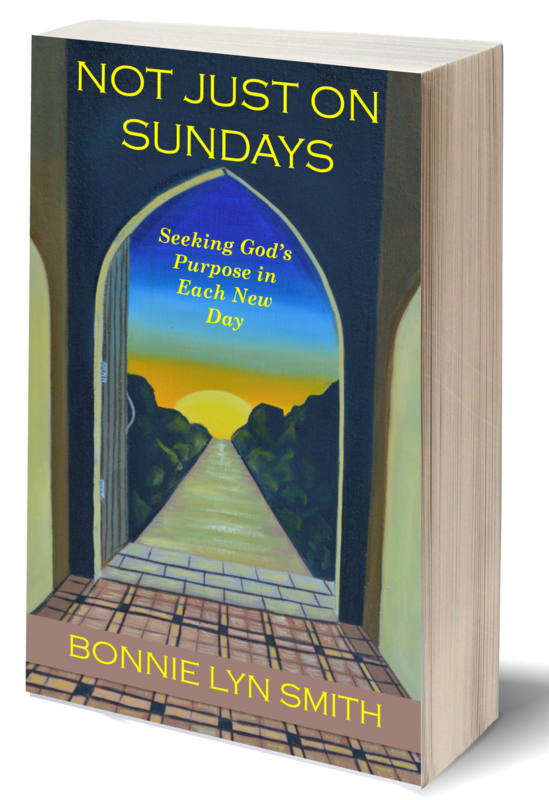 More anecdotal stories about faith, family, and relationships can be found in Not Just on Sundays: Seeking God’s Purpose in Each New Day (includes Book Club Discussion Questions). We are in a transition phase, and honestly it’s hard. I am having trouble being patient and waiting for God to work out his plan. Also – sometimes we also have to mourn what will never be. That’s a really good point, Jennie. We do a lot of mourning what will never be in this life, don’t we? Very true! Praying for your transition. Thanks for coming by “Espressos of Faith”! I am going through a transition and it is very difficult and scary. My faith is really being tested but I am doing everything I can to stand on His word. Oh, Mary, I am reminded to pray for you today. Thank you for coming by “Espressos of Faith”! I can appreciate that some transitions are way more significant than what I touch on here. Some punch us in the gut. I do believe these trials and transitions we go through prepare us more for the future, strengthen our faith and reliance on God, but some are so incredibly painful and difficult. Lifting you up in prayer. I get this… and i love your insight into a hard area in anyone’s life. When I made the decision to leave my career to stay home with my kids due to their chronic medical issues, it was difficult to realign my priorities and my identity. God had a plan though… and I look back and see all that I learned and how He grew me to be the woman I am now… and the blessings were and are still sweet and nourishing from that experience. Like you, I chose motherhood. And I’m so glad I did! What breaks my heart are the women who have a husband leave the marriage and ultimately the family, to force a transition BLOW to their hearts and their lives. Can you imagine? The constant blur of attempting to process and plan and adapt and grasping for ways to adjust to so many changes all at once- along with an aching heart. Oh, how so many women have to rise to this challenge. So far I’ve been blessed with the opportunity to process and find peace in making those transitions on my own timeline. You’re so right, TheMomCafe! This blog post doesn’t really address the “forced transitions” directly. That is a completely different story. I was thinking more of the ones that are interruptions in our plans in a more minor way, or ones that come on us but don’t necessarily rock us completely and make us do an about-face. Some of the same concepts still apply, but you’re right…some transitions require more processing, more time, more mourning, and much more strength and grace from our Father. Sometimes I touch on the deeper stuff. This one only really pulled back one layer. Good food for thought! Thank you. Why I have similar view on this. Amazing that I actually wrote about feeling good despite everything going wrong just last night. Thank you for your sweet, encouraging comments, Lux! I really appreciate you coming by “Espressos of Faith”! Interruptions refine us, don’t they? One way or another, they do. Blessings! Ah yes – such great advice – to properly let one season fully end – and grieve a bit if necessary – or rejoice, whatever is needed! – before jumping in to what is next! We are Empty Nesters as well – and god would not allow me to just jump right in to the next. Instead, He slowed me and quieted me, and made me (or let me) feel all the feels first. On this side of it, I am so thankful for that time! Blessings! Oh, I love your comment “feel all the feels” first. That makes a lot of sense. Thanks, Karrileea. It’s good to hear your perspective. Thanks for coming by “Espressos of Faith”! Bonnie this is SUCH a great post. So eloquently worded and just so inspiring. I’m definitely not a mother (and won’t be for quite awhile! ), but I can only imagine exactly what you mentioned above. The constant string of it all! I’m entering my senior year in college, and I’ve felt like my own personal transitions were sometimes far too abundant (wrote about it here! : http://cominguprosestheblog.com/talking-transitions/), but now I couldn’t be more grateful for them. You’re right…it’s about capitalizing on those moments in-between! Erica….I really feel encouraged by your comments. Thank you for stopping in and leaving some thoughts! Blessings to you in such an exciting (and transitional) chapter of your life! I’ll have to check out your blog site again! Thank you so much for the encouragement here, and for linking this up with us at Grace & Truth! Hollythewoo: Thank you for stopping by “Espressos of Faith”! Blessings on your day!